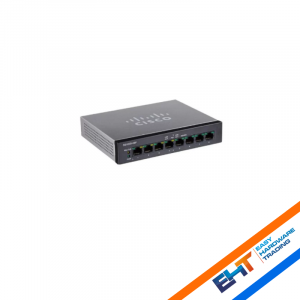 EHT is happy to announce you that the best performing hardware of the previous week is Cisco Systems 8-Port-SG100D-01-NA 8 Gigabit Switch. The product is perfect for people who work from home or have small businesses. The initial idea of creating this switch is for the usage in business networks. It is easy to use the switch for people who prefer working from home. The speed is fast and it has 16 Gbps of capacity, meaning that the data can be transferred to other users quickly. It also provides users with HDTV and VoIP phone connections. The size of the switch is 5.51, which makes it good for putting somewhere at home. The hardware also supports 10 Mbps, 100 Mbps, and 1,000 Mbps technical products. Furthermore, the Cisco switch saves energy when the devices turn off, meaning that the hardware changes its mode. This helps to consume less energy, which is also an advantage for a potential user of the switch. The product is very comfortable for using it, offering fast speed for data transfers and a power-saving mode. blog and definitely will come back from now on. I want to encourage you to continue your great posts, have a nice holiday weekend! Thanks for sharing excellent informations. Your web-site is so cool. I’m impressed by the details that you have on this website. It reveals how nicely you understand this subject. Bookmarked this web page, will come back for more articles. You, my friend, ROCK! I found simply the info I already searched everywhere and simply couldn’t come across. What a perfect web site. Thanks , I have just been looking for info about this topic for a while and yours is the best I have found out till now. However, what about the conclusion? Are you sure in regards to the supply? I?¦ve been exploring for a little bit for any high quality articles or blog posts in this kind of house . Exploring in Yahoo I ultimately stumbled upon this website. Reading this information So i am glad to convey that I have a very good uncanny feeling I discovered just what I needed. I so much surely will make sure to don?¦t forget this web site and provides it a look regularly. Nice read, I just passed this onto a colleague who was doing some research on that. And he actually bought me lunch as I found it for him smile So let me rephrase that: Thank you for lunch! “We have two ears and only one tongue in order that we may hear more and speak less.” by Laertius Diogenes.